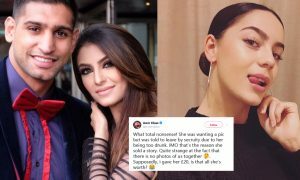 Boxer Aamir Khan Calls Faryal Makhdoom 'Irrelevant' While Flirting With Another Model on Social Media! 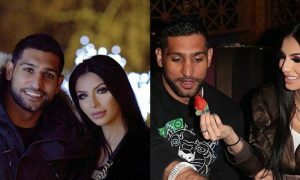 Boxer Amir Khan Calls Faryal Makhdoom ‘Irrelevant’ While Flirting With Another Model on Social Media! Amir Khan certainly does not know how to keep it in his pants or even how to value the sanctity of his marriage…or whatever that is left of it. The boxer recently became a father after a controversial rift with wife Faryal Makhdoom. Over last year’s Christmas, they got back together, but it seems the two were just living in a bubble. As per various international media outlets, Amir Khan flirted with transgender model from Britain, Talulah-Eve. Congratulations to my brother @Harrykingkhan and his wife on the arrival of their beautiful son Raffay. Amir Khan Tags the Wrong “Faryal” On His Anniversary Post and People Can’t Stop Laughing! This Girl Claims To Have Had One-Night Stand With Amir Khan and Things Are Getting Out Of Control! Imran Khan Wants to Make a WhatsApp Group Of Toilets in Pakistan Aur Ye Kya Mazaak Hai?